Nine frame analysis, how does our opening use, follow and challenge typical conventions of horror films. This first shot is our production company which we have made up, this shot lasts a few seconds and the words move from opposite ends too each other, I think this looks effective, we decided to use the dark red font colour to give hints of horror from the start as red is the colour of blood and therefore often associated with horror. This is a typical convention, I also like how the background has bits of brown on it as it looks like dried blood.This shot is completely silent as we saw no need for any sound effects for this shot and we hoped it would build suspense. This is the second shot of our film, I think the intention of the shot was good as zooming into the characters eye certainly looks effective and immediately gets the focus on this character telling the audience that this is the main character, however as we did not have a tripod for this section of filming the camera wobbles quite noticeably making the film look a little bit amateur from the start. We originally decided to have a voice over for this shot however we decided that having a voice over is a little bit cheesy and the one we recorded sounded wrong as we didn't know what would be said in a suicide note and it was near impossible to write a serious sounding one for our film, so we decided that we would keep this shot silent as this would build suspense. This shot is designed to look like a flashback and I am very happy with this as I feel the blue tint we have given the shot works well to represent a flashback, I feel this shot looks almost dreamy the way that the white and blue have mixed, this makes it look like a distant memory which is what we had hoped to achieve. The blue colour also makes Lewis our character stand out which is a good thing as it means the audiences attention is on them. we also left this shot silent as we feel it helped build the suspense and bullies shouting abuse is a bit cliché and sounded almost tacky. I Feel this shot breaks many of the conventions of horror as in this shot the audience feel sorry for the character which is later to become the killer and the villain of the story, this is different as horror films usually hide the identity of the killer and want them to be a mystery. this is a shot showing our character writing their suicide note, for this shot we made sure we used dark lighting as horror films are usually set in the dark and this is a convention we wanted to make sure we followed, I am really happy with this shot as this is where the music starts for the first time, this music begins quietly and slowly, I think this is good as it builds tension and suspense and makes you really want to know what going to happen. The jobe page tittle in the corner however I think looks out of place and I feel it could have been placed within the opening better. Shot five is intended to be a flashback, to try and make this scene look like a flashback we used a tint again however this time we didn't want to use the same tint as before as we wanted it to be different so we decided to use a red tint, this could suggest that this shot is more important as the red stands out and is the colour of blood and anger, this could suggest our character is very angry in this scene. The one weakness of this shot is that it doesn't have sound, we encountered a major problem while editing our film as during our classroom scene we lost the sound meaning characters lips were moving without their voices being heard. obviously this is a really bad thing as it means that the film opening doesn't make as much sense as it could of done. This shot follows another convention of horror films as our main character is shown as being an outsider and a loner which is how horror villains are often portrayed. This shot shows our character cutting themselves, I am relatively happy with how this shot looks however as we don't have special effects we cant make it look like the character is actually cutting themselves so our character is technically cutting an existing cut which doesn't really make sense, this is the only major weakness I see in this shot however as the music is in full swing being louder and more intense than before building the tension to entice the audience to watch on. this shot follows a very important convention of horror as horror films often include a lot of blood as it often makes audiences uneasy and this shot includes blood. This shot is a very important shot in our film as this is the shot that our character commits suicide. we decided to keep this shot very short to make sure that it was a shock to the audience and we wanted them to not expect it then think why this character which is been showed as the main character is being killed off at the start of the film. for this shot like the other shots inside the bedroom we made sure we used dark lighting to follow the conventions of horrors. When recording this shot we had to do it from behind as we did not have the special effects necessary to create a realistic cutting of the throat scene. This shot is a close up showing our characters wrists from where they have slit their wrists in the previous scene. I am fairly happy with how the wrists look in this scene as they look like realistic cuts and I feel the blood used on the wrists isn't overkill. however if this were real there would be a puddle of blood on floor from but as we didn't have the budget to replace the carpet if blood got on it we had to be careful and I feel this has sacrificed some elements of realism of the film. like many other scenes from the bedroom in the film we have decided to use dark lighting as to follow this horror convention. this shot follows a very important convention of horror as horror films often include a lot of blood as it often makes audiences uneasy and this shot includes blood. This is the final shot of our opening, this shot is a very important shot as it shows our character getting up after killing themselves, I am relatively happy with this shot however I feel that the way in which his arms are hanging down make him look like a zombie which isn't what we wanted. Another weakness in which we didn't take into account was the knife in the shot, In real life this knife would be covered in blood however we overlooked this. Another weakness is again that there is no blood on the floor. this shot like all the other shots inside the bedroom have dark lighting to follow the conventions of horror. this shot uses the common horror convention of dark lighting. The picture below shows the majority of characters which are seen in the opening, these are all teenagers and they are bullying our main character, this could suggest that im representing teenagers as mean, rude and like a bully in general. this is perhaps a bad thing as some people may watch this and think that all young people are actually bullies and are cruel to other people. The picture below shows a teacher, teaching during the lesson. In this shot the teacher is shown to join in, in the bullying of our main character Lewis by laughing at another child insulting them. This again could be seen as a bad thing as it could set up a negative and false stereotype of teachers as it is very rare that a teacher would actually do that. Below is the main character of the film, we wanted this character to look as Gothic as possible as people who follow a Gothic dress style and a Gothic personality are usually the outsiders of society and therefore alone and picked on which is what we intended as we thought this would make our character more believable. This could potentially be a bad thing as it could suggest and set up a stereotype that all Gothic people are murderers or in the opening in particular it could suggest that they are all victims. Also this could give people who are in a similar situation inspiration to take revenge on the people who mistreat them. We wanted to use an Emo/ Gothic type character so the audience could easily see how different they are too the other students due to their unusual appearance as we wanted the audience to easily identify why this character is being bullied by the other students. 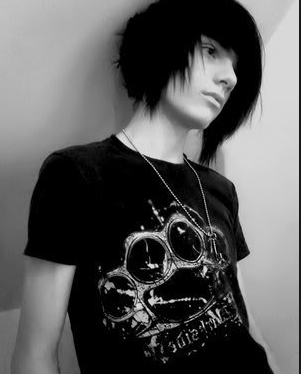 The image below is an image which we found by typing in "Stereotypical Emo" on the internet, there are many similarities between our character and the person shown in this image the most noticeable of these being the dark clothing. What kind of media institution might distribute my media product and why? During our film opening we featured the Lionsgate animation, the reason for this is that we believed as a group Lionsgate are the kind of company that would distribute our film as they distribute many horror films such as Hostel, Saw and the Texas Chainsaw massacre. We wanted to use Lionsgate as if we were really making this film they are the kind of company we would want to use as they are huge internationally and have a reputation for realistic, scary and high quality horror films and as we would want our film to be seen internationally rather than just in England they would be the ideal institution. We have designed our own production company, this is called sinister productions, as a production company sinister production would be in charge of assisting in the budgeting, scheduling, scripting, casting and overall making of the film, it is their job to find a directer and they would be liable if anything went wrong such as an actor getting injured are and damages. The first shot of our opening is of our production company and this is followed by Lionsgate this is a bad thing looking back as people would not have heard of sinister productions but they will have heard of Lionsgate so we should have Put Lionsgate first as to make people want to watch on. Who would be the audience of our film? As the creator of the film we would obviously hope to attract the biggest audience possible however it is impossible to target a film at everyone so the focus group of our target audience would be people aged between 16 and 21, The reason for this is that our film is a teen horror being as the majority of the characters are teenagers, some of our target audience may not be old enough to see the film but horror films which are an 18 usually do better as people expect them to be more intense, the reason 16 and 17 year olds are included in our target audience is that teenagers always tend to want to see the film which is one age rating up for them. We also hope to attract horror fanatics and people who generally enjoy horror films as we have aimed to make a typical horror film. Our film will be aimed at a wide range of nationalities and ethnicity's as although not present in our opening we will include characters from different nationalities and ethnic backgrounds, we believe this is important as schools in England are now multi-cultural and as we wasn't our film to be realistic we think it is important to include different cultures. How did we attract/ address our target audience? There are many ways in which we hoped to attract our target audience for example we used a mix of male and female characters to try and attract both genders. Another way in which we hope to attract our target audience is by having the majority of our characters within the age demographic in which we are targeting this is important as this improves the likelihood of our target audience being able to relate to the characters. A way in which we hope to attract different ethnic groups is by including characters from different cultures. One of our unique selling points could be our role reversal of the victim suddenly becoming the killer, we have included this paranormal twist within our film as we hope this will attract horror fans as it is something that is not commonly done and in recent years paranormal films have began to do better and better. We wanted to include a death early on as this is a technique used by other films such as scream and saw to entice the audience from the off, for this we included our suicide scene which although is not a typical horror convention we still feel that we are bending the death at the start convention. What have I learnt about technologies from the process of constructing our opening? Looking back at my preliminary task what do I feel I have learnt in the progression from it to my final film opening? I feel I have learnt a lot from when I did my preliminary task and since then during the course. For the preliminary task I was required to make sure I adhered to the 180 degree rule this rule is essential to keep the continuity of a clip so we made sure we adhered to this in our final piece. In our final opening we did not include a Mach on action shot or a shot reverse shot as there was not really an opportunity to. Since we did the preliminary task I have learnt how to edit more efficiently, creatively and too a much higher standard. For example I have learnt how to add colour tints to shots meaning I can now produce an effective looking flashback sequence. I have also learnt how to add music from the internet to a film meaning that we have a wider range of sound effects which we can include in our film. When we recorded our preliminary task we were poorly prepared meaning that filming took much longer than it needed too, from this we learnt that planning is important and its vital to plan in advance so a filming schedule is essential in advance so no one makes plans which would stop them from being able to help create the film. Another thing which I feel I have learned while planning is how to make realistic looking cut effects and how to use this style of make-up to create a realistic wound I feel that this would help with future projects of a similar nature. A final thing which I feel I have learnt is how making sure you have a variety of camera shots can make editing easier as it means you have a larger variety of camera shots to choose from making the editing process much easier and meaning the final project can have a larger variety of camera shots. Every year our school holds an annual showcase where the projects produced by media students in year 11, 12 and 13 can showcase their work and receive feedback on their work and maybe if your lucky win an award. Although our film opening did not actually win any rewards I am still pleased to have received a nomination for best make-up as this shows how good our make-up really was as all the films showcased were of a high quality and we consider to have been nominated for a reward an achievement even if we did not win. During this showcase we did not receive as much feedback as we would have liked however a few people didn't like the lack of sound at the start of the film and when the characters were talking. During this showcase we were given the opportunity to look at other films which have been produced by other groups which were given the same task as us, although I don't feel our film is bad I do feel that other groups were perhaps more creative and executed their ideas better.